Nanotechnology simply refers to very small particles and doesn’t specify the material the particles come from, so when researchers sat down to develop a nanorobot they were faced with literally endless possibilities for its material makeup. Biological nanobots have technically been created, as have large or conventionally-sized robots with the ability to work on the nanoscale. But the traditional idea of nanorobots involves them being all or mostly mechanical, and these types of nanobots are the next step in nanotechnology. There are many scientists and research groups currently hard at work on shrinking and adapting the conventional robot and they’ve gotten them pretty small, but not quite down to the nanoscale as of yet. The main problem seems to be the robotic power source for such a tiny machine. Traditionally, most robots have a solar cell or some kind of battery pack, but obviously these are many times too large for a nanobot. However, the answer may lie in nuclear technology. Researchers consider it highly likely that when equipped with a thin film of radioactive material, nanobots will be able to fuel themselves on particles released by decaying atoms. This fuel technology is easily scaled down to nano-size. It also proves immensely efficient because with such a self-driven system in place, nanobots would be able to function indefinitely and never require a replacement fuel cell as they would with batteries or solar power. If and when the fully functional mechanical nanobot does emerge, as it most likely will in the next few years, its primary material may be silicon. Silicon has always been the first choice for delicate electronics and has the right qualities to make a successful scaled-down robot, even one as tiny as a few hundred nanometers. It is strong enough to last and conduct electricity on a regular basis, but also flexible enough to be manipulated in various ways; this makes it the universal one-size-fits-all electronic material. However, constructing nanobots out of silicon would subject them to the same issues that other silicon electronics face, one of which is that they are not biodegradable. If nanobots were to be produced on a large scale their enduring materials would not be as dangerous as all the microchips and computer electronics currently sitting in our landfills, but they would still be another small drain on our natural resources. Consequently it becomes even more pressing to find a mass-recycling solution for them. Silicon can be recycled into low-grade products like solar cells, but the process is long, complicated, and usually costly. Up to this point in time, the closest thing to a purely mechanical nanorobot that has ever been created was the work of U.C. Berkeley affiliate Kris Pister. He invented a solar-powered robot that measures only 8.5 millimeters and can walk slowly on two “legs” like humans do. True to form, Pister composed his robot primarily of tiny silicon pieces called transducers which are capable of taking the energy generated by the robot’s solar cell and turning it into mechanical power. Although extremely tiny, technically the robot that Pister created is macroscopic. But it does represent a valuable step in the scaling-down process of traditional electromechanical robots. One of the issues associated with the final creation of the nanobot is autonomy. A suggested alternative to silicon components is installing a system whereby small clusters of molecules react to forces in their environment, convert these reactions into power, and use the resulting energy in order to move themselves forward. But if the motive power has been generated by inevitable chemical or physical reactions, will the nanobot still qualify as autonomous? Critics say no. Since the ultimate goal is to create an autonomous self-moving nanorobot, this approach seems to miss the goal and scientists anticipate that the true innovations will lie in steadily shrinking down the traditional electromechanical components: power supply, processor, transducer, and integration. With these components in place and adjusted to fit the scale and functioning peculiarities of the nanorobot, researchers anticipate that the nanorobot will soon be created. These miniscule robots may be up and running within the next 25 years. One of the primary difficulties that has prevented them from being completed up to this point is the simple issue of how one goes about building things that are this tiny. In the future, scientists expect to create micro-factories that will pump out legions of nanobots for human consumption. But so far the only tools we have for working at this level are those found on larger robots, and in some cases they are not convenient for the type of construction involved in producing a nanorobot. So the work is progressing, but slowly. Hard oxides and metals that are typically used for electronics will be essential, but many of them (including silicon) have to be effectively reduced to the nanoscale before any serious work can go forward. Prototypes have been built using biological components, but the ultimate goal is to achieve a purely electromechanical model. Scientists want to build mechanical nanobots on the bacteria model. In terms of characteristics and function, a bacteria is simply a natural nanomachine gone haywire. Scientists hope that by steadily adapting individual bacteria over time and potentially adding electrical components by degrees, they will eventually be able to convert them into nanobots. Probably the first functioning nanobots will have to be at least partly biological so that we can use these pre-runners to create their more sophisticated descendants. In the middle stage of our nanobot development we will probably see high-production nano-factories emerge, staffed by partly-biological nanorobots which can then in turn produce an ultimate nanorobot: a fully mechanical, voice-programmed microscopic machine capable of performing a wide array of useful functions. Scientists consider this the end goal in all nanotechnological research, and expect that it will take several stages to get there. 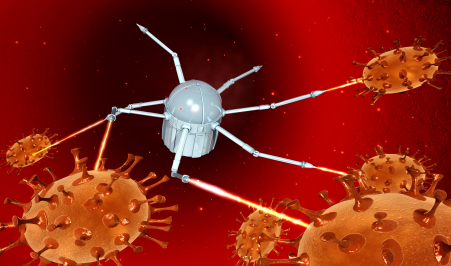 So, in other words, fans of the ideal nanorobot may have to wait. But eventually we will have this ultimate technology and all of its amazing capabilities at our disposal. This entry was posted on July 7, 2009, 10:01 am and is filed under nanobots. You can follow any responses to this entry through RSS 2.0. You can leave a response, or trackback from your own site. What Are the Capabilities of Nanobots?